We are experiencing a crisis, and facing it we are not able anymore to understand it or finding solutions to it without a paradimg shift in our thinking. Such shift involves theories about complexity, emergence, network, self-organization, material systems, digital tools and their consequences on our model of reality, knowledge, cognition, culture, economy, ecology and, ultimately, architecture. What is the common element in this network of interconnected systems? All of them are operating in a continuous changing condition (far from equilibrium) and rely on information (matter-energy) exchange. Information lies at the bottom of physical things, it is involved in morphogenesis as well as in the evolution of culture and communication. We’ll take a look on how information plays that role in nature (as well as what nature is under this perspective) and in architecture, especially in its linkages with digital tools and generative and parametric approaches. 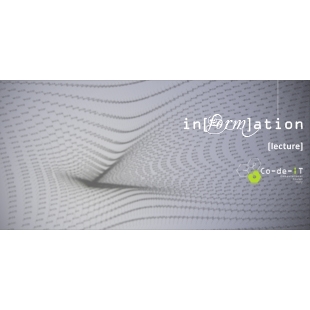 in[form]ation is a lecture about the role of information (both as knowledge unit and morphogenetic driver) in generative processes and design strategies in the world of complexity. How do we move from a crisis towards an improved awareness of nature as a system of emergent processes, non linear networks and digital tools as media for design and production? The lecture tries to address this multiplicitous question, and since february 2009, when it was first presented, it was changed ad evolved to the present set of slides. Most probably it will evolve further, nonetheless we would like to share it at the present level for a very important reason: it does not matter that much to us to deliver a smoothly refined discourse in order to elegantly wrap up the topic, rather our intention is to trigger the discussion bringing our point of view, with its inevitable imperfections. Only in the confrontation among different positions there is the chance of growth and change. What you will find in the document above are the lecture slides. For image copyrights, read the notice on the last slide. Lecture material is licensed under a Creative Commons Attribution-NonCommercial-ShareAlike3.0 UnportedLicense. Interesting Sharing. Hope to read more from you!